In this era where traditional methods of project development are no more enough, Agile is the need of the hour. Demand for agile professionals has increased in the IT industry and also picking up in other areas of engineering as well. This demand triggers the need for Agile certifications which recruiting organizations can bank with. In this article, we shall discuss some of the top-ranked agile certifications among many available in the market. 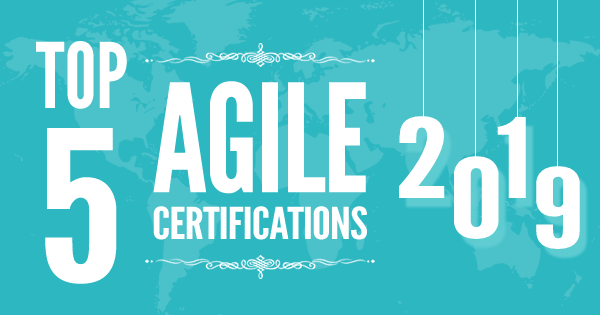 There is a big pool of certifications available in the market to choose for gaining credentials in the Agile domain. Sometimes when you have a huge pool you get confused about which agile certification to be taken at what point of time. Here is the diagram that shows the various certifications available in the market. You have to choose one of the best agile certifications that is good for you. No doubt, when it comes to investing money and time, an individual will do a lot of research for which certification is appropriate for him to invest so that he can get maximum ROI. As per different researchers on the internet from different bodies, “Scrum” as the agile methodology is most popular. Scrum is easy to understand Agile methodology due to which it becomes the obvious choice. Also, as it is a widely used methodology, there are many case studies available for it now. That’s the reason there are multiple certifications based on Scrum. In our discussion, we shall be concentrating on below agile certifications and shall discuss why it’s important to target for these certifications. Here are the top 5 Agile certifications which are the best for Agile professionals who want to build their career with Agile methodology. The Agile Certified Practitioner certification is one of the best project management certifications. It is offered by the Project Management Institute (PMI). PMI-ACP certification is intended for the project management professionals who are using agile methodologies and practices in their projects or planning to move to the agile. PMI-ACP certification recognizes and validates that the candidate has real-world experience of working on agile projects. It also demonstrates the knowledge and skills of the candidate about various subdomains of agile such as Kanban, Scrum, Lean, and others. The candidates who achieve the PMI Agile Certified Practitioner certification have to earn 30 professional development units (PDUs) every year to renew their PMI-ACP certification. Scrum involves a set of practices that are used in the management of agile projects, mainly for software development. Scrum Alliance is a leading organization for those who are using Scrum practices in their projects. There are 3 popular certifications for the Agile Scrum professionals that are offered by Scrum Alliance – Certified Scrum Master, Certified Scrum Product Owner, and Certified Scrum Developer. These certifications are for the scrum master, scrum product owner, and scrum developer respectively. The candidate needs to attend a training program to achieve this certification. For Certified Scrum Master (SCM) and Certified Scrum Product Owner (CSPO), the training is for 2 days, while Certified Scrum Developer (CSD) involves 5 days training. Enhance your skills with project management terms and PMP formulas, and get yourself ready to pass the agile and project management certifications. The Certified Scrum Professional certification offered by Scrum Alliance is a professional level certification. It is one of the top agile certifications (also, top project management certifications). This certification recognizes and demonstrates the ability of the candidate in advanced practices, artifacts, roles, and procedures of the Scrum Framework. One doesn’t need to join any training for the Certified Scrum Professional certification. Professional level scrum certifications offer by scrum.org validates the candidate’s knowledge in the understanding of Scrum and how to apply scrum practices and framework in real-world situations. There are professional level certifications for all the scrum product owners, scrum masters, and scrum developers. One doesn’t need to join any certification training from scrum.org to achieve these certifications but it’s compulsory to pass the certification exam. Here are the assessments to check and demonstrate the knowledge of candidate and understanding of the role. There is a different level of certifications, such as for Professional Scrum Master, there are three levels of the exam, and the candidate will receive the badge of Professional Scrum Master when he’ll clear all three exams. SAFe Scaled Agilist, also known as SAFe Agilist or Scaled Agilist, is a two days training course provided by the training providers. The candidates who have more than 5 years of experience in software development, testing, project management, business analysis or scrum. In this course, the candidate gets detailed information about Lean-Agile leadership principles and how to launch SAFe in agile. A SAFe Agilist also knows how to maintain and release value-added software continuously for continuous development. The candidates who are aspired to learn transformational skills should join the leading SAFe Agilist course and get ahead in their careers with the SAFe Agilist job. Let’s have a comparison of all these five and then move on to discuss the criteria to choose and prioritize. How to Choose the Best Agile Certification? Above comparison shows multiple faces of the top agile certifications we have taken. One important point to note is the majority of the certifications are Scrum based. Reason for that is very simple. Scrum is the most used form of agile. Even after knowing all the particulars above certifications, the dilemma is which one to choose. Let’s have a clear picture of the same. We feel it’s a three-step approach. Anyone looking to gain knowledge about agile should start from the basics of Agile/Scrum. Once basics are developed, advance knowledge should be developed. Scaling is the third step as this is about scaling agile competency at organization level which is definitely the final step. Also Read: Do we need Project Managers in Agile? Scrum Alliance and Scrum.org offer three certifications for three different roles in scrum i.e. Scrum Master, Product Owner and developer are the basics which one can target to start with. CSM/CSPO/CSD is definitely easier to crack than PSM/PSPO/PSD I certifications but the knowledge gained in CSM is also important. As Scrum alliance mandate training for CSM/CSPO/CSD, it gives good exposure to the basics of Scrum. Though scrum.org has the foundation and advanced courses for PSM/PSPO/PSD, it’s not mandated and from knowledge parse, professionals until mandated generally don’t go for it. Preparing for Agile and Scrum Interview? Here’re Top 40 Agile Scrum Interview Questions and Answers to help you crack the interview! After basics, its time to take a little deep dive approach. 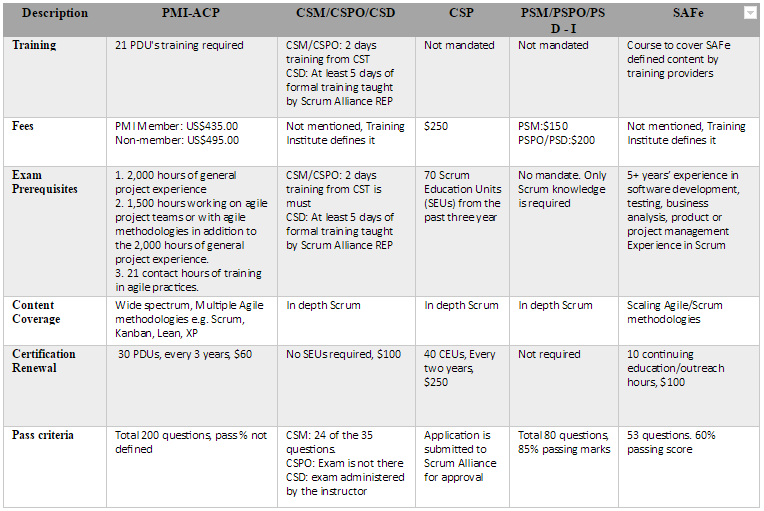 Definitely, if you are CSM/CSPO/CSD, you will go for the next step in scrum alliance provided CSP. However, the spectrum of knowledge given by PMI-ACP is not comparable. CSP doesn’t mandate any training, it just needs some Scrum Education units to apply for certification. Though the application tests the knowledge, it’s not tested. No test is there for CSP. PMI-ACP is hard from entry to exit i.e. its prerequisites itself is a little tough. It ensures and expects prior agile experience and project management experience along with training PDUs. Exam as well covers a wide spectrum of agile flavors and not only limited to Scrum. It covers Lean, Kanban, XP, TDD etc. 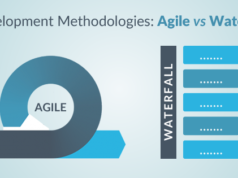 which gives more in-depth of agile overall. The exam is conducted in a closed/secure environment like any other PMI certification. That’s the reason why PMI-ACP holds a lot of value and gained credibility in the market. There are advanced certifications by Scrum.org as level II and III for PSM/PSPO as well which can be targeted for but again that is the only scrum based and becomes even harder as compared to the level I of it. This is something different from normal agile knowledge. This we can refer to a special skill at which is required for executives, managers and Agile change agents responsible for leading a Lean/Agile change initiative in a large software enterprise. 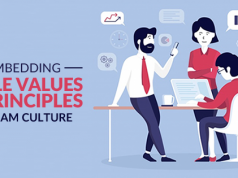 This is required for those executives who have already implemented agile at a small scale in the organization and now aspire for taking it to the next scaled framework level. SAFe SA certification validates knowledge in applying the Scaled Agile Framework, lean, and product development flow principles in an enterprise context so they can lead to the adoption of the Scaled Agile Framework. There are many more certifications available in the market in addition to the five that we discussed above. Professionals have to make a wise call based on what they are looking for. If the target is to get benefits in career or changing a job, PMI-ACP &CSM has more market value and popularity. If the target is to gain pure knowledge PSM-I is best to start with then going higher in its levels. So, choose an Agile certification as per your career path and requirement. Have any questions about Agile certifications? Just write it below in the comment box or submit in Whizlabs Helpdesk, we’ll be happy to answer! Wish you a remarkable Agile career! Thank you, you would think that would be case, but not always true. There are a lot of people in the IT industry that have not adapted to Agile framework or understand the methodologies or practices. Good article that clarifies in detail about the commonly asked question on Scrum Master Certificaiton. Very detailed summary – still relevant in 2018. Good work and thanks for sharing. The PMI-ACP is nice because it forces people who think Scrum and Agile are synonymous into recognizes there is much more to Agile than Scrum and incremental development. I am a BA with 5 years of experience and planing to go for Agile certification.Please advice which one will be best suites my profession to build a better career in this agile world. There are many certifications available in Agile. The ACP (Agile Certified Professional) by PMI is the recommended and popular certification. This is one of the toughest too. If you are more focusing only on Scrum, you can go for Certified Scrum Master (CSM) by Scrum Alliance. This can be obtained in short period of time. There are more certifications available in the market such as PSM, SAFe and ASM. your blog consists of valuable information. thank you giving such a good information. Good Blog… Please update Top 5 Agile Certification of 2019 :: How does Agile Certification help you? nice blog , thank you.. Thank you so much for writing up this informative post about Agile certifications, it is very helpful and interesting for me. Keep up the great job. Very nice blog. Informative one. Thank you. I am looking for “Product Owner” certification. Please suggest me a good one with reason for the same. The blog contains informational and educational material. The post enhances my thoughts and experience. So nice! Great overview of options available in the Agile certification world written in clear and concise format. This article has helped me define my next steps. Thank you! How about Prince2 Agile? I was thinking of using it as a combination certification for both Project Management and Agile. Please advice. PRINCE2 Agile is definitely a good choice. PRINCE2 is popular in UK region than US and Asia. Do consider your/your company’s location. I have 5 years of experience in content management field as a process lead. Please suggest which one should I opt for a better career prospective. Highly informative blog ! Thanks for this.. I have a question. I am into Finance (shared services operations – 100% non IT) for over 13 years now. Have been hearing a lot about Scrum in the recent past. How good or useful it would be, if i take up either CSM or PSM to start with. Reasons for looking into scrum : 1) Career progression into senior management level without changing domain 2) Upskill myself with the latest on project management. I have 7months experience in working in a SAFe Agile project as a QA. In total I have 6.5years of IT experience.Please suggest an appropriate certification for me. 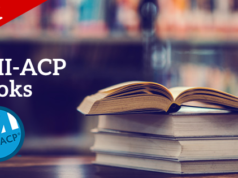 I am confused between PMI ACP and CSM. You can say Certified Scrum Master (CSM) as a basic level certification and also it focuses only on Scrum practices. You can consider this certificate if you’re following Scrum on your projects. 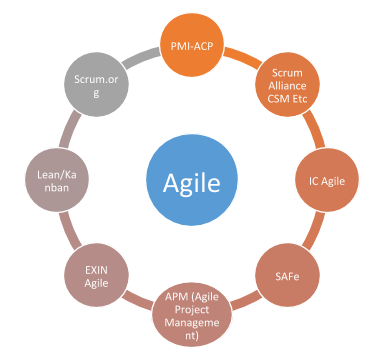 PMI ACP covers everything on Agile including Scrum. You can work on any frameworks like Kanban, XP, Scrum if you are a PMI ACP certified. SAFe also becoming popular nowadays. If you have enough Agile project experience, I would recommend PMI ACP. PMI ACP and CSM are the easiest but the most expensive. Cheaper, no training required, but more difficult. I am looking for scrum certification and this blog is very useful. Can someone help me getting the training for certification from India or USA. Classes should be over weekend or in evening (USA-Eastern Time). I am from non technical background. Being a six sign black belt and practising quality from last 7 years. Now I like to move into agile methodology hence could you guide which certificate i can go for and whether Agile or Scrum master is preferable. Scrumstudy certifications are definitely not bad. It’s becoming popular, just not in the top list (as per my opinion). Right now the CSM from Scrum Alliance is better recongnized globally. I want to do CSM course. Where should I get all details? Could you please provide link. Yes some issues are there, will fix it asap.